As the weather heats up, I find myself looking for different ways to keep cool. I’ll turn the air-conditioning up in my house, drink lots of water, and jump in the pool, but all that is still not enough sometimes. I need something that will cool me down right away, and keep me cool for quite a while. That is when I turn to ice pops! Eating one can take a while, but the whole time it’s keeping you cool! Plus, I like to make my own ice pops because I can customize them! Usually I will add fresh fruit and coconut water to mine, as both ingredients cool me down quickly. I also always have extra ice pop molds on hand in case I want to make a bigger batch! Following is a list of some of my favorites and others I discovered that I will definitely make this summer. Creamy Coconut: Mix one can of fat-free evaporated milk, one can of coconut milk, ½ a cup of confectioners’ sugar, 2 teaspoons of coconut extract, and a sprinkle of ground cinnamon. Once combined, pour mixture evenly into ice pop molds. Freeze until solid. Chocolate Fudge: Mix one package of instant chocolate pudding, ½ a cup of white sugar, and three cups of milk. Once combined, pour into ice pop molds and freeze until solid. Fruit and Yogurt: In a blender, mix one cup of plain yogurt, one cup of fresh fruit, and two tablespoons of honey. 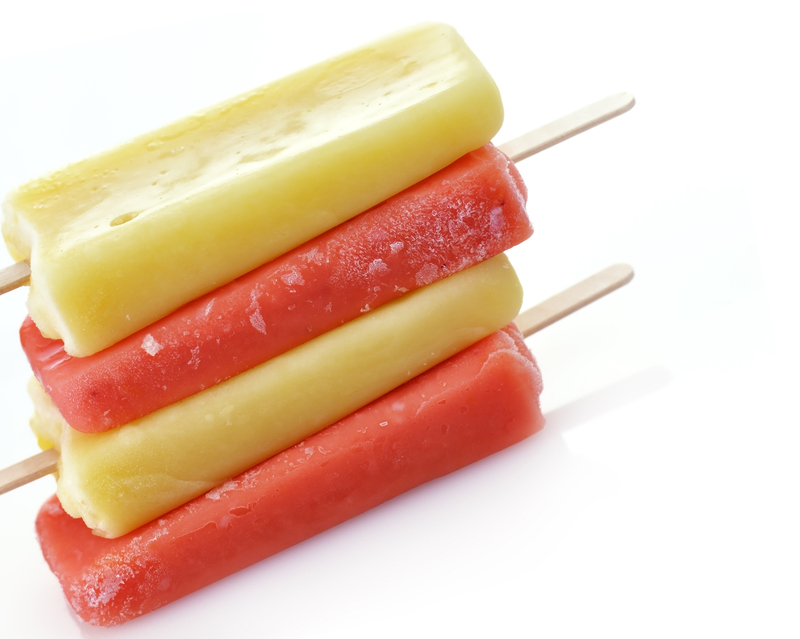 After everything is blended, add evenly to ice pop molds, and freeze until solid. Strawberries and Cream: Toss two cups of strawberries in 1/3 a cup of sugar and two teaspoons of vanilla extract. Let sit out for 15 minutes. After the 15 minutes is up, blend the strawberries with one cup of vanilla yogurt. Once everything is smooth, pour evenly into ice pop molds, and freeze. Avocado-Lime: Bring one cup of water and ½ a cup of white sugar to a boil. Stir until the sugar is dissolved, then take the mixture off heat, and set it aside. Pour the mixture into a blender with three peeled and pitted avocados. Add the juice of one lime, and ¼ a teaspoon of salt, then blend everything together. Pour evenly into ice pop molds, and freeze. Tropical Kiwi: Stir one 14 ounce can of coconut milk and three tablespoons of white sugar together in a bowl. Pour the mixture into a blender. Add one chopped banana, and one eight-ounce can of crushed pineapple. Blend this all together until smooth. Chop one kiwi fruit into little pieces. Add kiwi pieces to bottom of ice pop molds. Pour coconut milk and fruit blend over kiwi, and freeze. Blueberry: Blend one pint of fresh blueberries, one cup of vanilla yogurt, one cup of milk, and sugar to taste in a blender. Pour mixture evenly into ice pop molds. Freeze until solid. Citrus-Watermelon: Cut seedless watermelon into small pieces and add to a blender. Blend, and add more pieces as needed until you have five cups of pureed watermelon. Add ¾ cup of orange juice, and 1/3 cup of sugar. Blend again until it is all mixed well. Pour evenly into ice pop molds, and freeze. Banana: Mix three-and-a-half ounces of instant banana pudding mix and two cups of skim milk together. Add the mixture, and one banana cut into small pieces into a blender. Blend until smooth. Pour evenly over ice pop molds, and freeze. Cantaloupe: Blend one and ½ cups of cubed cantaloupe in a blender until smooth. In a saucepan, combine one cup of heavy whipping cream and ½ a cup of sugar over low heat. Stir until sugar is dissolved. Remove from the heat, and stir in the blended cantaloupe. Pour evenly into ice pop molds, and freeze. Creamy Peanut Butter: In a saucepan over medium heat, heat one-and-a-half cups of whole milk until it bubbles at the edges. In a bowl, combine three tablespoons of white sugar, two tablespoons of cornstarch, and a pinch of salt. Add ¼ cup of the hot milk to the dry mixture, and combine until smooth. Pour this mixture back into the hot milk, whisking to combine. Continue to stir the mixture until it becomes thick. Remove from heat, and stir in one teaspoon of vanilla extract and ¾ cup of peanut butter. Pour evenly into ice pop molds, and freeze. Orange Cream: Whisk together one cup of freshly squeezed orange juice, one cup of coconut milk, three tablespoons of honey, and ½ teaspoon of vanilla extract. Pour mixture evenly into ice pop molds, and freeze. Try these treats out as the weather heats up, and make sure you share your results with us in the comments and on Facebook! This entry was posted in Food, Fruit, Just For Fun, Produce, Recipes, Vegetables, Water, Weather and tagged Arizona, Desert, Dessert, Fruit, heat, Ice pop, Popsicle, spring, summer, Weather. Bookmark the permalink. Thanks for the question! Right now there is no info on this topic in other languages on our site. We suggest Googling the topic with your settings changed to your preferred language! Have a great day!